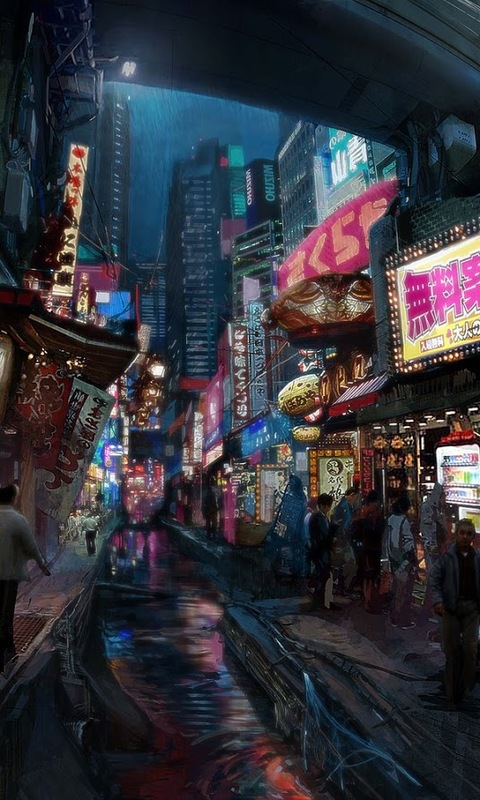 The chemistry of William Gibson’s Neuromancer. Ninsei, courtesy of Vincenzo Natali via twitter. I recently purchased a new hard copy of William Gibson’s first novel (and sci-fi classic), Neuromancer. I make no secrets about this book being my favourite of all time, and I’ve even got an ongoing project wherein I’m composing a musical companion to the book (progress is slow). While there have been rumours of this book getting made into a movie for at least 10 years now, the project seems permanently stuck in development hell. But the same could be said of Altered Carbon several years ago, and look where we are now! Apart from inventing the term “cyberspace” and predicting virtual reality long before it became commonplace, Neuromancer also contains some interesting tidbits of chemistry. Being a chemist myself, specifically one in the pharma industry, these little nuggets of scientific prose jump out at me, and quite pleasantly Gibson (for the most part) does a good job of using them appropriately. I wanted to examine the pharmaceutical elements of the book, which are almost entirely used by Case and Peter Riviera, its two biggest junkies. Dex is a shorthand name for dextroamphetamine. Anyone familiar with the structure of methamphetamine will recognize that it is almost the same molecule–it’s simply missing one methyl group. To be even more specific, dextroamphetamine is a single enantiomer of amphetamine. Dextroamphetamine (right) and levoamphetamine. Note that Dextroamphetamine is actually the S enantiomer, but is named for the direction in which it rotates polarized light. The dashed bond on each hydrogen indicates that it is projecting away from the viewer. The only difference in structure between these two molecules is the “chirality” (which comes from the Greek word for hand, transliterated roughly as “kheir”) of that carbon center connecting the benzyl, methyl, NH2, and hydrogen. Interestingly, dextroiamphetamine (which is in fact the S-enantiomer!) is the more active of the two in the human body, with effects including increased concentration, CNS stimulation, and in higher doses, euphoria and libido enhancement. Street amphetamine methamphetamine (crystal meth, or simply meth) is almost always a mixture of the two enantiomers of methamphetamine, because isolating a single enantiomer usually requires more advanced equipment, more time, and more money. The same is true of amphetamine, which back when it was still either legal or commonly encountered as a street drug (often known as benzedrine, or “bennies”) was usually had as a racemate. Enantiomerically pure dextroamphetamine is used in drugs for narcolepsy and ADHD. Most people are probably familiar with the drug Adderall, which is a 3:1 mixture of dextroamphetamine and levoamphetamine. There are other drug products which use different ratios, the most well-known of which is probably Dexedrine, which is a 100% dextroamphetamine sulfate formulation. Thus, when Case takes “Brazilian dex”, he is quite simply imbibing a powerful CNS stimulant that has been known for decades and used by everyone from beat poets to fighter pilots and college students. Some other type of hand-wavy metabolism-altering or endocrine-altering thing. MAO is a frequent culprit in the lack of oral bioavailability of alkaloid drugs. Dimethyltryptamine (DMT) for instance, has almost no oral bioavailability because MAO-A is abundantly present in the digestive tract and oxidizes it before it can be absorbed into the blood stream and carried to the brain. Ayahuasca, a South American traditional entheogenic drug, involves ingesting DMT along with a MAO inhibitor, which allows the powerful and profound psychedelic experiences used in shamanistic rituals, all with the relative convenience of an oral administration (YMMV). In Case’s world this particular bit of homebrewed combination therapy wouldn’t be necessary since almost everyone uses “derms” to dose themselves, meaning the gastrointestinal levels of MAO wouldn’t be a concern as the drug would go straight to the bloodstream. CYP450 is another one that you may come across from time to time. It is responsible for doing the lion’s share of xenobiotics in the human body. These enzymes are highly concentrated in the liver, and generally deal with drugs in one way: oxidation. What this does is (very generally) to become more water soluble, allowing excretion via the renal system and urinary tract. One reason you may have heard of it is that a certain blockbuster drug named Lipitor has some unusual contraindications. People taking this drug (which is a statin inhibitor) are told not to ingest large quantities of grapefruit. The reason for this is that grapefruit and grapefruit juice contain a relatively potent class of CYP450 inhibitor called furanocoumarins, which causes the Lipitor to hang around in the body unmetabolized (and therefore performing its intended function) longer than it should, which can cause problems. CYP450 is also produced in the pancreas, relevant to the current discussion. A less prevalent but still important transformation is the cleavage of the benzyl ester to produce ecgonine methyl ester. Both of these modifications are quite rapid, and responsible for cocaine’s notoriously short duration of effect: roughly 30 minutes after insufflation. While the metabolites hang around for longer, they don’t possess cocaine’s “desirable” effects. Cocaine is also metabolized to a lesser extent by enzymes like CYP450 to produce metabolites with -OH groups on the phenyl ring. So the “new pancreas and liver” thing is actually not completely outlandish, though of course we get nothing else by way of in-depth explanation, so we can chalk this one up to the vagaries of good science fiction writing: just enough to make it seem doable without so much detail that it begins to fall apart. We’ve already discussed cocaine, and most are probably familiar with its effects, even if not first hand. meperidine, however, is probably better known by its trade name Demerol (or possibly its alternate name pethidine). Meperidine is an analgesic synthetic opioid, though it bears no resemblance to naturally-derived opioids like morphine, heroin, hydromorphone (Dilaudid), or codeine, all of which containe the characteristic fused ring structure at their core (we’ll get into the structures later on in the post). Meperidine and other synthetic opioids are so named simply because they also bind to the opioid receptors in the brain. This means that meperidine is, like other opioids, an analgesic sedative and CNS depressant. It is commonly used in labour for pain management (administered primarily via IV, and not by epidural). Similar to dex, this is a pretty pedestrian drug reference, but it’s still nice that Gibson gets it right. When Case makes his forst foray into space with Molly, Peter, and Armitage, he suffers from space adaptation syndrome, or SAS. Basically a nice way of saying motion sickness coupled with weightlessness and your guts being in positions they’ve never been before. So like anyone who experiences these symptoms, he uses a transdermal scopolamine (L-hyoscamine) patch. This one is actually the least imaginative (or most grounded in reality) of the bunch, because these exist now, and have for years. Scopolamine is used to treat motion sickness and is typically used as a transdermal patch. This is because its oral bioavailability isn’t great (less than 30%), and the patch allows a slow release over the course of three days, very handy if you’re on a boat and know you won’t be leaving for a while. The kink here, though, is that scopolamine belongs to the class of drugs called tropane alkaloids, of which cocaine is also a member. The name “tropane” refers to the bicyclic nitrogen-containing core at the center of these molecules. This can be seen below at left, on its own, and in cocaine (second from left), atropine (second from right) and scopolamine (right). Tropane (left), cocaine (middle left), atropine (middle right), and scopolamine. So if Case is incapable of getting any effects from cocaine, would he really be able to benefit from scopolamine’s inhibition of the muscarinic receptors? The answer would appear to be “No” if we take into consideration the most likely ways in which Case’s endocrine and hepatic system have been juiced up. As previously mentioned, cocaine’s most prevalent routes of metabolism are via esterase cleavages of the methyl and benzoyl groups. Scopolamine’s benzoyl group shuold be similarly susceptible. Also, since, unlike cocaine, scopolamine does not possess a methyl ester on its tropane ring, another principal path of metabolism appears to be via CYP450 enzymes in the liver which remove the N-methyl group, making it more water soluble. So in this particular case, it seems like Gibson may not be correct. Scopolamine most likely would not be able to get past Case’s boosted xenobiotic metabolism. The consolation prize, however, is that he was probably quite right that “the stimulants the manufacturer included to counter the scop” almost certainly wouldn’t, either: they’re probably things like ephedrine or pseudoephedirine (both amphetamines, interestingly these ones are diastereomers of each other), or possibly phenylephrine (structurally very similar to pseudoephedrine). While visiting Freeside, Case decides he wants to get high, really, really badly. Luckily he meets a woman named Cath, who happens to be almost permanently dusted on something she calls “beta-phenethylamine”. Case tries a taste and it does the trick not once, not twice, but three times throughout the remainder of the novel, albeit accompanied by hangovers so grievous that it’s a wonder Case makes it through dinner and a show, let alone the cyberspace run of a lifetime. This simple arrangement of atoms is such fertile ground for psychoactive compounds that the late, great chemist Alexander Shulgin wrote a book on it. Other well-known compounds in this class include mescaline, MDMA, and the 2C-X series of drugs (where X can be substituted by bromine, iodine, an ethyl group, or even a thioether). So one might be inclined to think that this vagueness allows Gibson to cover his bases without getting painted into a corner, chemically speaking. Alas, any and all compounds in this class would almost certainly not be metabolized any differently than an amphetamine, as they all have that tricky NH2-CH2-CH2-phenyl skeleton, which is a prime target for MAO. Based on what we’ve assumed about his surgical enhancements, Case almost certainly would not get wasted on this drug or any in its class. As we mentioned before, Peter is a speedball artist. One of the drugs he uses is called meperidine. Meperidine is relatively easy to synthesize, and as we know still sees a lot of use in modern times. A drug that is perhaps less known, however, is one of its structural isomers, called MPPP. You can see the two structures below (meperidine at left, MPPP at middle left). Meperidine (left), MPPP (middle left), MPTP (middle right), and MPP+. As you can see, very similar. But the subtle change in the ester configuration results in different reactivity under certain circumstances. In brief, MPPP is very easy to decarboxylate by overcooking it or exposing it to moisture (or even better, both). In addition, MPPP’s penultimate intermediate is the free alcohol, which can easily dehydrate. When either of these things happens, something called MPTP is produced, seen above at middle right. MPTP is more correctly called N-methyl-4-phenyl-1,2,3,6-tetrahydropyridine, as Molly chants out late in the novel. MPTP itself is oxidized by MAO in the body to form MPP+ (N-methyl-4-phenylpyridinium) seen at right. Both MPTP and MPP+ are neurotoxins, but MPP+ is the stronger of the two, being highly toxic to dopamine neurons in the substantia nigra of the brain. A very unfortunate and imprudent graduate student in the 1970s (1976 to be exact), Barry Kidston, self-injected a preparation he had made of MPPP (at the time a legal “designer drug”) which apparently had gone slightly awry, and almost immediately began exhibiting symptoms akin to those of Parkinson’s disease (one in which dopamine is present in chronically low amounts in the brain). His symptoms were successfully treated with L-dopa (a known treatment for Parkinson’s) for a time. His case was not unique; in fact this phenomenon was observed several more times and a book was written about it by the neurologist who helped to treat some Bay-area addicts with these same symptoms as late as 1982. Interestingly, MPP+’s chloride salt is still used today as a herbicide under the name cyperquat. As for Kidston, he seemed rather determined in his drug use, and was found by his parents catatonic and drooling on September 4th, 1978. After a brief stay at home, he left, and promptly overdosed on cocaine, which finally proved fatal. Unfortunately for Gibson, the decarboxylation side reaction to produce MPTP only occurs in the synthesis of MPPP, and not in that of meperidine. The carboxyl group in meperidine is connected to the piperidine ring via its carbonyl carbon, as opposed to the oxygen as in MPPP. This means that if it hydrolyzes, it simply produces the free acid. It can be exceptionally difficult to get this type of structure to decarboxylate, so much so that there are numerous publications with it as their aim. This is not universally true: THC, perhaps the most commonly-imbibed illegal drug in the world, is actually a decarboxylated product of THCA, tetrahydrocannabinic acid, which is how most THC is found in plants. This decarboxylation is facile, requiring only heat and time. But meperidine is not THC, and such reactions tend to be very sensitive to specific moieties in the molecular structure (in THCA’s case, the phenol -OH adjacent to the carboxylic acid in question). So in this case Gibson unfortunately got the chemistry very slightly wrong. This can easily be forgiven: such structural isomerism has tripped up many a fledgling chemist, and indeed, sometimes even the pros get it wrong. Overall Gibson does better than most would. He gets the chemistry about half right, and does a bit of handwaving in a few parts. He even steps into some pharmacology and doesn’t do too badly. I’d be willing to bet that a lot of this is owed at least in part to his known penchant for dabbling in drugs in the past, but no matter where it comes from, it’s pretty impressive. Just one more reason why this book remains my favourite of all-time, and why I recommend that everyone read it. Not that I need any more reasons. This post was adapted, expanded, and improved from an earlier post on my personal blog. Nick is a process chemist who works for Gilead Sciences at their Edmonton, Alberta location. His interests include sustainable and flow chemistry and rotten puns. Try Jacek Dukaj’s “Black Oceans”. fascinating read, combining two of my interests in one piece. Thanks for putting this together. Unfortunately, while the scopolamine patch may have been the most grounded in reality back in 1984, it’s come ungrounded since! Scopolamine patches are no longer used for spacesickness, because they don’t work very well against it — nobody knows why. In fact, none of the usual motion-sickness drugs works very well against spacesickness; it’s different from terrestrial motion sickness in several ways, and this is one of them. What’s used now is injected promethazine, which doesn’t prevent feeling sick but does suppress vomiting — not a real cure but a considerable practical improvement. Thanks for the information! very interesting stuff. I actually had no idea they used promethazine for space-sickness. One case where “customers don’t like injectables” is probably more true than most. This Is really good because it helps me to understand chemistry in clearer and more precise way, besides helping me to do my homework, It’s geat! Enlightening to say the least. I guess you’ve convinced me to go back to reread this book after illustrating it so many years ago. Into this, thanks. Any thoughts on “Zone was addicted to a brand of hypnotic the Japanese called Cloud Dancers.”? Also, what are your thoughts on the “Smith & Wesson riot gun [with a] barrel made of paper-thin alloy wrapped with a kilometer of glass filament.”? I’ll comment with other terms I’m curious about. Another is “free monomers.” I know what monomers are, but not free ones. What links self-heating drinks and the D-day landings? Chemistry Blog © 2019. All Rights Reserved.